Right now my face feels warm and is no doubt red with embarrassment. We arrived here in Ho Chi Minh (in the south of Vietnam) yesterday evening from Cambodia. We quickly found a cheap hotel and realized that we were really hungry, so we decided to discuss our "secret plan" for Vietnam over dinner. I told William that I was really interested in seeing important places during the Vietnam war. I told him that I really wanted to go to Saigon which I was pretty sure was in the center of Vietnam a few hundred kilometers north of where we are in Ho Chi Minh. We decided that Saigon was the perfect place to carry out our plan. That night I hopped onto Wikipedia to dig into this country's history and suddenly realized how little I knew. We were already in "Saigon". Saigon got renamed to "Ho Chi Minh" after the Vietnam War (which is called the "American War" here). Today we visited the Reunification Palace (formerly known as Independence Palace) which was the "white house" of South Vietnam during the war. 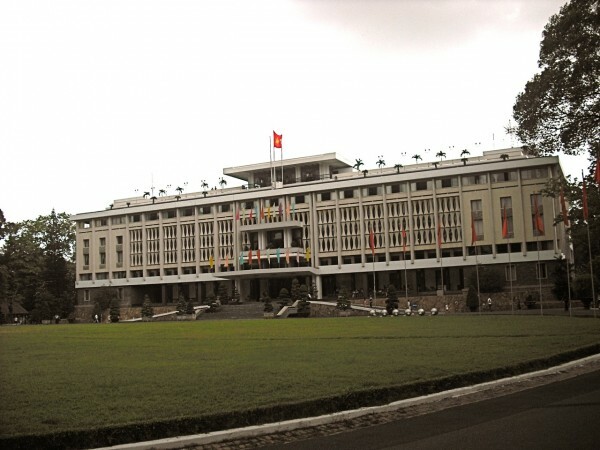 In 1975 the war ended when north Vietnamese tanks busted down the gates of the palace. It was so weird to be in such a historical place that was so famous back in the 70's. Today most teens, and sadly, a lot of people my age don't even know what the Reunification Place is. I knew what it was, but there were a lot of things I didn't know. History is a story coming from a perspective. The history I learned in America is different than the history the Vietnamese learn, or the Germans learn, or the Africans learn. For example, the Vietnam War history I got in the American public schools never mentioned the My Lai Massacre. That's a significant event to forget to mention. This isn't a political forum and I'm not a hippie that thinks that we should poop rainbows, but in my opinion, war is never a good thing. Reminds of a yank tourist telling his Italian tour guide that "I really loved this Firenze place we just visited but I was hoping you could take us to Florence too". Take careful note of all you see. The experiences you are having and the things you are learning are amazing, heartbreaking, and need to be understood. How tragic that men could do such horrific deeds. I'm wondering if there are many American's there now. I remember Vietnam being on the news every night when I was a child. It wasn't until the war was over that I realized that wasn't the norm. Be safe. I look forward to hearing of your adventures. Love you! I'd love to be able to poop rainbows. Just think about how awesome that'd be. Kudos to you for being willing to admit that! Please, take the time to visit the War Remnants Museum there in HCMC. 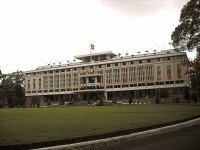 Here's a short excerpt from Wikipedia: "The House for Displaying War Crimes of American Imperialism and the Puppet Government [of South Vietnam]." Later it was known as the Museum of American War Crimes, then as the War Crimes Museum until as recently as 1993. Talk about seeing the war from the other side! If you visit Hanoi, which I hope you do, check out the Hanoi Hilton as well. The War Remnants Museum really is worth a visit. I also found it very interesting to see and crawl through the Cu Chi Tunnels. You can go there by bus. It's hard to imagine people actually lived in there. You are quite right. History is a matter of perspective, and too often the winners rewrite it. If you find any rainbows please be sure to take a photo! Sam - I feel your pain. I'm designing lights for "The King and I". About the King of Siam. I was looking up background info for it... and discovered that it is Thailand, it was renamed to Thailand in more recent history. I've heard of this Vietnam you spoke of...I thought it was an army base here in the States, that they call, "'Nam" for short????? no?? ?